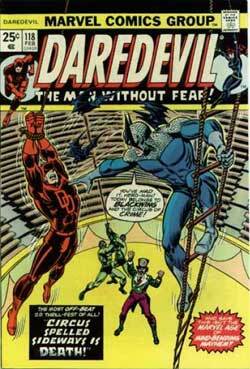 The issue starts with Daredevil catching a couple of costumed goons robbing a bank. They look a little like HYDRA agents actually, or maybe like that shot of Homer at the nuclear power plant from the opening sequence of The Simpson’s. The thing is, they’re annoyingly talkative and, sadly enough, so is Daredevil. Gerry Conway, the writer of this issue, must have been channeling Stan Lee on a bad day when he wrote it. The scene is also far too long and, as it turns out, has nothing to do with the rest of the plot except to remind our featured bad guy, the Ringmaster, that Daredevil is still around. “Hiiiiiii Yo!” Really? And how does Foggy end up sprawled across the desk like that? And are those two men actually bouncing? 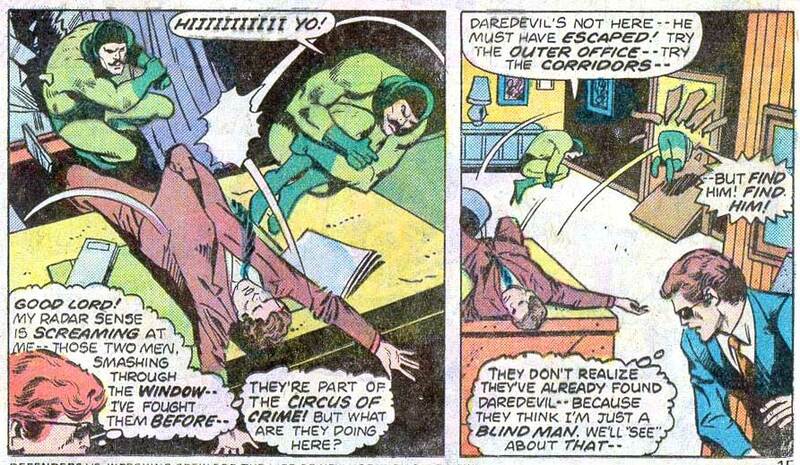 Anyway, since they obviously can’t find Daredevil anywhere, they simply keep on bouncing. Matt changes to Daredevil and goes after them. He also has the pleasure of getting acquainted with Princess Python and her lovely snake. Oh, boy. No real animals were killed in the production of this comic, or so we think. The fight continues and it’s not looking good for Daredevil. Luckily, Foggy comes to and starts calling out for Matt. Afraid of being caught, the Circus of Crime decide to take off and Matt sneaks off to change his clothes again. He meets up with Foggy, and a very strange scene takes place. Foggy starts talking about how he’s never believed in coincidences and how he just caught wind of the Circus of Crime doing a benefit(!) at Shea stadium that same night. However, this apparent coincidence (having someone looking like a circus freak break into your office the same night some serious circus freaks are performing at a televised event) has nothing to do with what just happened. As is explained by Matt later on the same page, Foggy never made the connection between the Circus of Crime and their attackers. Okay, so what coincidence is he talking about, and why did he decide to talk to Matt about a newly released band of criminals? Oh, and why would anyone hire the Circus of Crime, all of whom have newly been released from prison, to perform at a benefit? I’m not saying you shouldn’t be allowed back in society after you’ve done time in prison, but this is just bizarre. Daredevil hurries over to Shea stadium where the performance is about to begin. Ringmaster is, of course, wearing his hypnotic hat which he was apparently allowed to keep after his release and before long, both television and live audiences are in a trance. Everyone is instructed to give their money and valuables to Blackwing’s bats which are sent out across the city and soon the riches are raining down on the Ringmaster and his gang. 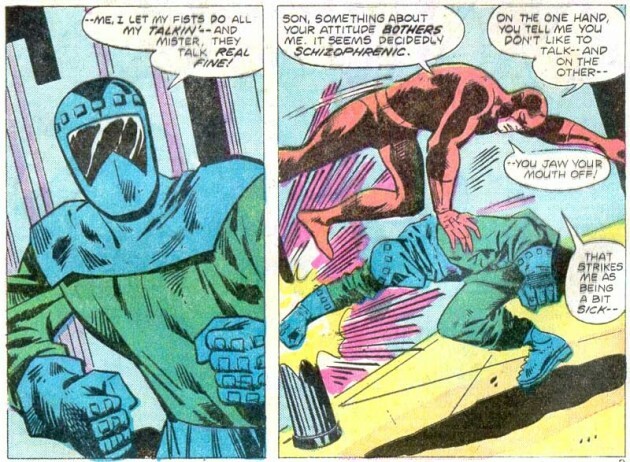 Now Daredevil shows up and tells them that he’s called the police, and the police quickly arrive on the scene. The End. Yup, that’s it, that’s the whole issue and the final scene is such a snooze fest that the rest of the story seems exciting by comparison. 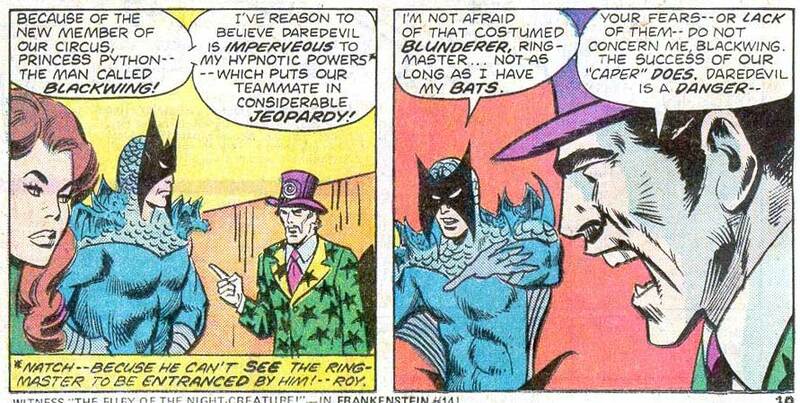 To make matters worse, the artist for this issue, Don Heck, seems just about as inspired as Gerry Conway. Angles and perspectives are off in places and some panels just look weird. Even the lettering, by a certain Karen Pocock, is bad, with at least one word balloon pointing at the wrong speaker. Daredevil #118 is an insult to comic book fans everywhere. ‘Nuff said. Wow. I feel like the guy at a rock show who yells “Freebird!” only to have the band actually play it. Thanks, Christine! Your review was as amusing as I thought it’d be. I still have no idea why things happen in this issue. 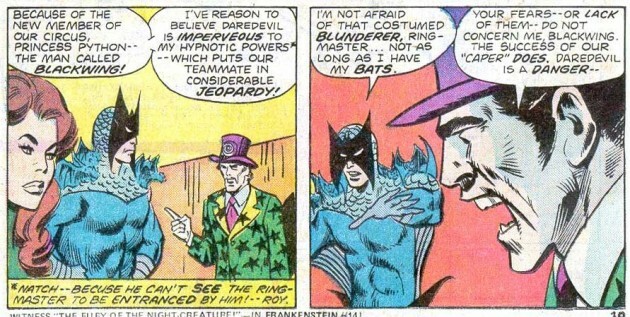 The Circus’s entire plan is to hypnotize their audience (and tv audience) into allowing Batwing’s bats to steal the audience’s belongings. Why the need for the hypnotism? Just send out the bats! I doubt the comings and goings of bats are that easy to trace. More pointedly, how do the bats know which persons in NYC to steal from? I doubt they can distinguish between hypnotized and non-hypnotized persons. How do they know what to take? How many bats are there? How could the Circus rely on non-hypnotized folks not calling the cops? Was all of NYC watching this broadcast? Lastly, I think Matt’s amazing skills of interrogation deserve mention. After capturing the Ringmaster, Matt wants the location of the escaped Blackwing. He thinks to himself, “Maybe if I twist Ringmaster’s arm, I’ll get a lead on where this Blackwing is likely to hide out.” Uh oh. Daredevil’s about to get mean! And so Matt says to Ringmaster, “Any chance of your telling me where to find Blackwing, Rings?” *sigh* Gee, I can’t believe that didn’t work, Matt. Every so often, it’s fun to read cheesy dialogue such as this. ‘Mister, my fists talk real fine!’ Love it. Great review of a crazy issue. But don’t forget about costume sense. Blackwing’s costume is rubbish.